Eder Cruz-Alvarado, a member of Leo’s 2011 graduating class, attended Valparaiso University on a Gates Millennium Scholarship. Eder is the first Gates Millennium Scholar in Leo history and was the only Gates Scholar chosen from a Chicago Catholic League school in 2011. The scholarship, funded through the Bill and Melinda Gates Foundation, is designed to “create leaders for America’s future.” Eder was one of 1,000 Gates Scholars chosen from a pool of more than 250,000 applicants, nearly 10,000 from the state of Illinois. The award is based on academic achievement, leadership potential and community service. It covers undergraduate tuition, room and board, books and all fees and is renewable through graduate school if the recipient pursues studies in a wide range of science, health or education-related fields. Eder graduated with a 4.18 grade-point average in Leo’s Honors Program and ranked third in his class. In addition to his membership in the National Honor Society, Eder served as President of the Student Council and competed on the chess team. He also boxed and ran track while at Leo, and in his “spare time” he worked as a retail clerk in a department store. 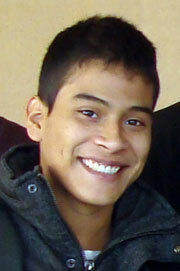 Eder is the son of Marie Alvarado of Chicago’s Gage Park neighborhood and a graduate of St. Gall’s Grammar School. He was an engineering major at Valparaiso and is pursuing a career in automotive design.